1-CD-Album DigiPac (4-plated) with 40-page booklet, 29 tracks, playing time 66:06. 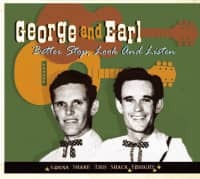 A welcome first CD reissue by one of the classic hillbilly vocal duos, George and Earl! 29 high class 1950s sides made in Nashville featuring musicians ranging from Hank Williams's band to the A team! Contains all 6 original 78s by George McCormick and Earl Aycock and another 6 singles by George McCormick. Sweet Little Miss Blue Eyes and If You Got Anything Good are often cited among the best country duet recordings of all time! Three of the songs were scheduled for Hank Williams to record before he died. George McCormick later led the Wagonmasters band for Porter Wagoner and was Dolly Parton's first duet partner on the Wagoner TV show. Earl Aycock later was a DJ in Texas and Louisiana. A 40-page booklet by Martin Hawkins featuring unpublished interviews with George McCormick. 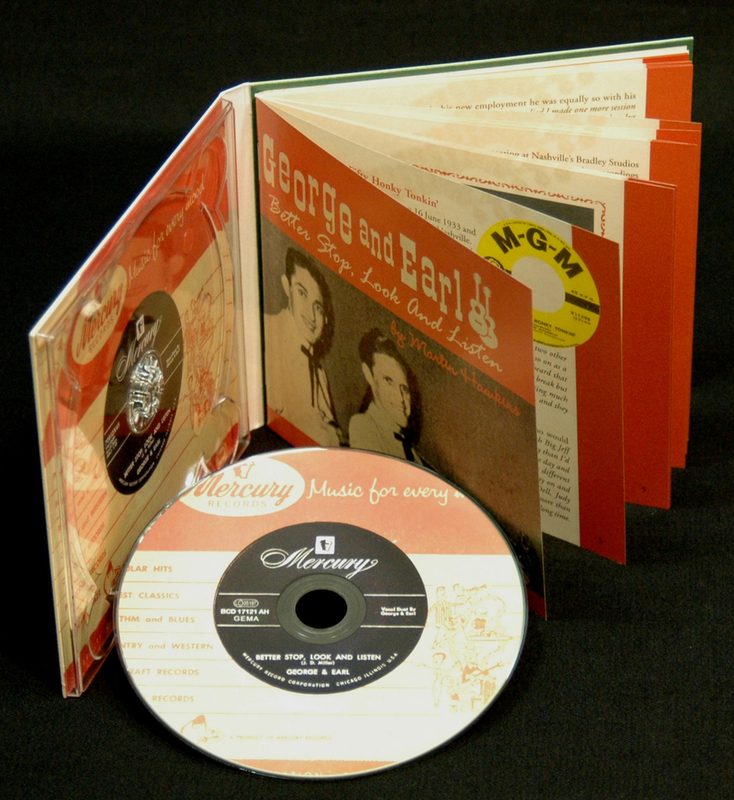 This CD tells about two very different singers and musicians who came together for a brief two years to make some of the best and most interesting duet recordings of the 1950s. The still-prevalent sound of Hank Williams was just beginning to give way to newer styles of popular country music and the upstart sounds of rockabilly. George and Earl together provided a link from the country duets of the '30s, '40s and '50s, the likes of the Delmores and the Louvins, to the harmonies of country music as developed after the rockabilly era. In terms of commercial success they were outgunned by the Everly Brothers, but they had a very different duet style and one that has endured just as long. T his is the story of two separate and very different singers and musicians. It is also the story of how they came together for a brief two years to make some of the most interesting duet recordings of the 1950s. Normally vocal duos were kinfolks who had sung together since the cradle but George McCormick from Tennessee and Earl Aycock from Mississippi did not meet until they were in their early twenties and they had very different vocal styles. They did share similar apprenticeships in post-war hillbilly and honky tonk bands and they both had an aptitude for the less-is-more approach to singing plaintive and humorous story songs, each allowing the other their time in the limelight but contributing just the right harmonies when called for. 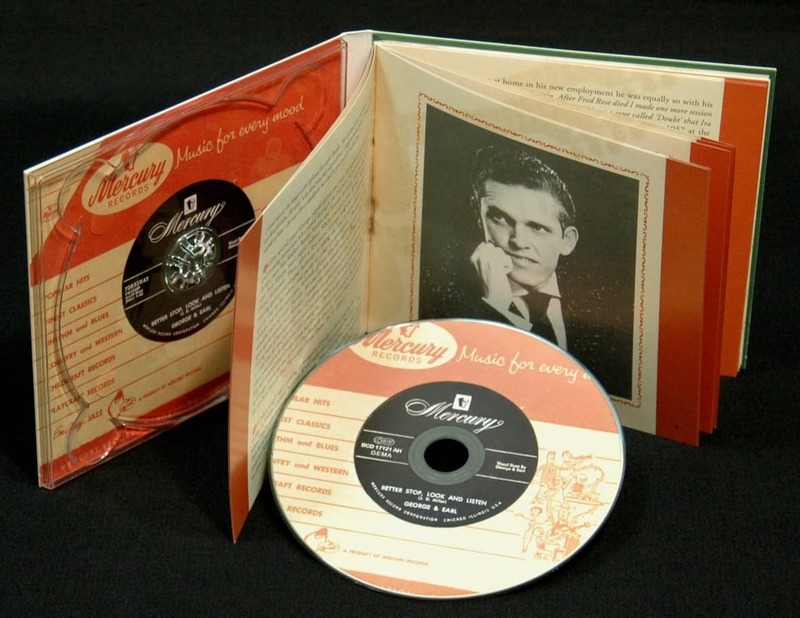 The music in this CD chronicles the important years of the mid-1950s when the still-prevalent sound of Hank Williams was just beginning to give way to newer styles of popular country music and to the upstart sounds of rockabilly. This is music that reaches out from tradition to remind us of the past but also points to the future. 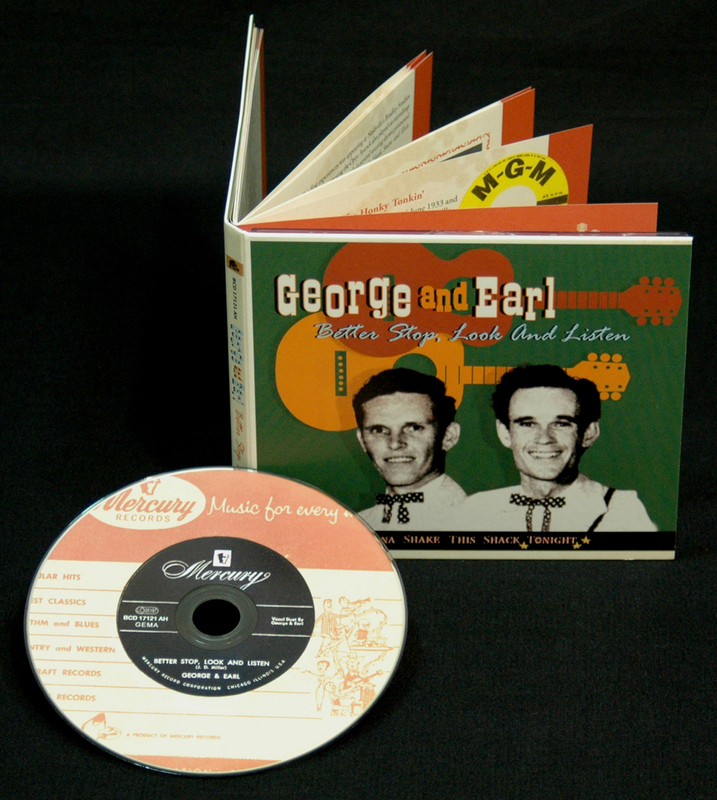 Here you will find all 12 songs recorded by the duo of George and Earl for Mercury Records along with the 15 surviving songs George McCormick recorded for MGM as a solo artist. Together the songs make up an enthralling package of classic country music, made all the more interesting because there were no major hits and the duo partnership did not last. George McCormick was born on 16 June 1933 and spent his early life in the hilly area north of Nashville. He told me: "I come from a little place called Defeated Creek fifteen miles from Carthage, Tennessee. It was just a little country store, a few houses and a two-room schoolhouse." Life was tough in rural Tennessee in the Depression years and George did not take to the country life. He did show an interest in music though and formed a string band with two friends, playing in the local area. He said: "I left home when I was fourteen years of age to come to Nashville, me and two other boys, the Thomas Brothers. As three of us we played little old cakewalks and so on as a band. We found ourselves a slot on radio in Gallatin, at WHIN. Then we heard that Carl Tipton wanted someone to work with him – we thought it would be a big break but it was real bad. We worked with him for a year, in 1947, but he wasn't getting much work and we couldn't make no money. The Thomas boys decided to go home, and they left." However, help was soon at hand in the form of a bandleader who would transform George's life and career. "The very next week a job came up with Big Jeff Bess in his Radio Playboys band. It paid $45 a week and that was more money than I'd seen in my life. We played schoolhouses and square dance halls at the end of the day and we'd be on WLAC radio at 5.30 every morning. We worked four, five or six different shows every morning until 8.30 or so – we played with Jeff and then we'd stay on and work with Bob Jennings, Ted and Wanda, Jack and Mary Lou, Mac O'Dell, Judy Derryberry and Andy Wilson. Jeff was a big man back then. He was making more than anybody on the Opry. He was very influential in Nashville. He was top dog for a long time. I lived out at the house with Jeff and his wife Tootsie. She looked after me once I went to work with him. He said, 'why don't you just stay with us'. I appreciated that. I thought the world of him – he was like a daddy to me and he practically raised me." For several years George played guitar and bass alongside a number of up and coming musicians who passed through the Playboys band and on to greater things; men like fiddlers Benny Martin and Tommy Jackson, bassists Ike Inman and Bob Moore, steel player Johnny Sibert and guitarists Spider Wilson and Floyd Robinson. Then, after a few years, George was able to graduate from playing guitar and singing harmony to taking the lead in some shows. This was partly due to his talent, and partly to other circumstances. "Because Jeff was a drinker, one of the party guys, he'd take off on a Saturday night after the show and he wouldn't turn up until Tuesday. Me and the boys would have to go into WLAC and open up the station on a Monday. I opened the shows and did 'em just like he'd do 'em. I'd sing more of my own songs but I'd perform the whole show just in the manner he did it. I did that for best part of three years on just about every Monday morning and some other times when he didn't feel like coming in." 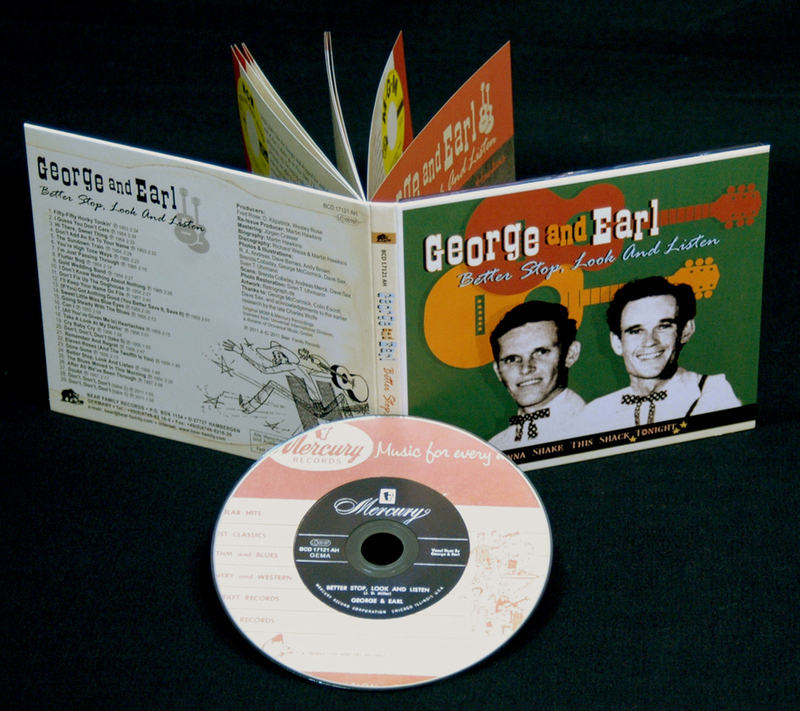 Partly as payment for his reliability, Big Jeff ensured that George made his first recordings as a vocalist; he was credited as George Mack on one of Jeff's Dot Records discs in 1952. These may be heard on the Bear Family disc 'Tennessee Home Brew,' BCD 16941. Other people were starting to recognise George's talent and he left in 1953 to play in Martha Carson's band on WSM radio and the Grand Ole Opry. "That's when I had to join the union," he remembered. "How I left Jeff was this way. Jimmy Rule heard me in a night club here in Nashville. In fact it was a new club a ways outside town on Dickerson Road, called the 'Starlite'. A lady said that she would build a club out there if Jeff and the band would play there regularly, which we did, and Jimmy Rule was the one who organised the other talent for the club. He was a songwriter, a promoter, and a columnist for the music press here in town. I was a fan of Hank Williams and I tried to sing a little like him. And then Hank died and Jimmy Rule got me a contract with Hank's label. Back then it was hard to get off on your own. You didn't have a lot of people to back you like they do now. You needed someone to work for your interests. The aim then was to get record sales going in some regions – to get your disc on territorial or regional disc jockey charts. We had some regional success with our discs." In 1954 McCormick was featured in the magazine 'Hoedown', who felt that "MGM Records has come up with an ace in the hole in a new singer ... George McCormick, the boy whose first release 'Fifty Fifty Honky Tonkin'' plowed to the top of many territorial best seller charts. A year ago George was doing spots with Big Jeff on Nashville's WLAC and was singing with the same artist on Saturday nights at a local night club. By chance, Jimmy Rule, 'Hoedown's' Nashville correspondent, visited the club and was so impressed with George that ... he presented him to Fred Rose, ... a contract with MGM was immediately forthcoming." Later that year 'Hoedown' reported that George was "currently a member of the Martha Carson troupe, appearing on the Grand Ole Opry ... and his second [MGM] release 'Hi There Sweet Thing' is already drawing raves from DJs and music men." McCormick made three sessions in the year after he signed to MGM in the summer of 1953. They took place at the Castle Recording Studio in Nashville and featured the very best session musicians available. The first two sessions were led by Chet Atkins and featured guitarist Jerry Byrd and fiddle player Tommy Jackson while the third session featured Hank Williams's old band of Sammy Pruett, Don Helms and Jerry Rivers. George remembered: "My MGM records were done with Fred Rose producing. Fred was just one of the best songwriters out. We would go in with a song that I liked, and he'd sit at the piano – he couldn't see at all well and he'd get the music or the lyrics in front of the piano and put them up to his nose almost. Then he'd work on that song real fast. Some he'd let go more or less as they were, but others he'd take apart though he wouldn't want any credit for doing it. I was just a dumb kid from the country. I didn't have any education, I just wanted to play music. I remember that there was a song Fred was working with that had the word 'halo' in it. Well I didn't know what a halo was and I would say it as 'hello' and Fred would stop the song to explain it to me. I never did get it right on the recording. He had your interests at heart, and he was very good at man management – if you did a deal with Fred Rose, you thought like you were set." McCormick's first session occurred in August 1953 and his first two MGM singles came from it. Fifty Fifty Honky Tonkin' was a song Fred Rose had apparently written for Hank Williams, a tale of relationships and nightlife brimming with homespun insights. George really does sound like Hank on this, without being a 'soundalike'; he had the spirit and the style and a hard edge to his voice but a degree of originality too. Jerry Byrd and Tommy Jackson do their best to recreate the trademark Drifting Cowboys licks and the top class rhythm section of Chet Atkins, Lightnin' Chance and Ray Edenton takes the performance along at an appropriately jaunty pace. The song was backed on disc by Don't Add An Ex To Your Name, a clever song from Knoxville writer Arthur Q. Smith who was renowned for selling many of his other songs for cash. The co-writer was Jim Hess who George recalled as "Smith's musician friend in Knoxville." Disc jockey and TV personality 'Big' Jim Hess bought the song from Smith sometime during the early '50s. Hess was then a DJ at the popular new radio station WIVK on Gay Street in downtown Knoxville. Hess bought several songs from Smith and another writer, Bill Benson, who both hung out at Knoxville’s Three Feathers Tavern near WNOX radio. Both the vocal and the band exude 'country' on this song and they manage to sound both traditional and current. These were two tremendously strong tracks and although the disc was a good territorial seller it could easily have been a major hit. The disc was followed some months later by the two other songs from the session. Hi There Sweet Thing was another excellent, catchy Hank-ish song written by George's manager, Jimmy Rule, and it also gained good reviews and territorial sales. The halo George had trouble with can be heard about one minute fifty seconds into the song. Its flipside was I Guess You Don't Care, Hank-like again in all respects. It was written by Roy Pryor who, George told me, "was just a regular guy in Nashville who drove a milk truck. He liked to write songs. He came to me with that song and I took it to Fred Rose. Fred tore it all apart and put it back together." Customer evaluation for "Better Stop, Look And Listen - Gonna Shake Th"